Congratulations to Mr Rob Wilkinson who has been presented with a Certificate of Good Service for his exemplary service throughout his time as a cadet. Rob joined 234 (City of Durham) Squadron in 2009. In the six years that he has been a member of the Squadron, he has taken part in an enormous range of activities, picking up numerous qualifications and awards along the way, and developing into the confident and capable young man of whom we are extremely proud. Rob, or Sgt Wilkinson as he then was, has been an outstanding Cadet over many years, and has been an excellent ambassador for us in the wider community; always polite, smart and helpful. He has contributed a huge amount to the Squadron in his commitment to supporting Adventure Training and DofE activities. 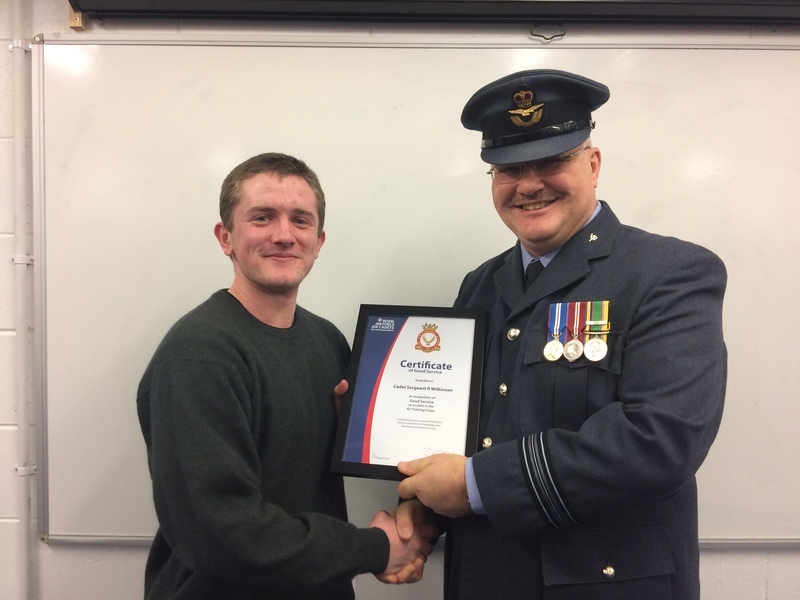 On turning 20, Rob became a Civilian Instructor and continued to aid the squadron. He is now moving away from the area and so is sadly leaving us but we wish him all the best for the future!